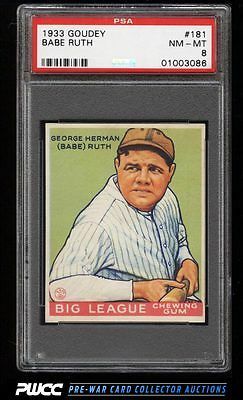 The world of pre-war commodities, the 1933 Goudey Babe Ruth issues hold a special slot, perhaps reign supreme according to many. Offered here can only be described as a 'world class investment', representing the very best of what this hobby has to offer the advanced collector. An almost dead centered specimen boasting flawless surfaces and four very square corners. The edges are smooth and the color is strong. Rarely do such important investment pieces hit the public auction block; this is indeed a special opportunity, not to be missed. One of nearly 20,000 cards, lots, and sets up for bid in our 7th Auction of 2016. Click on the link above to view the other PWCC auction lots.